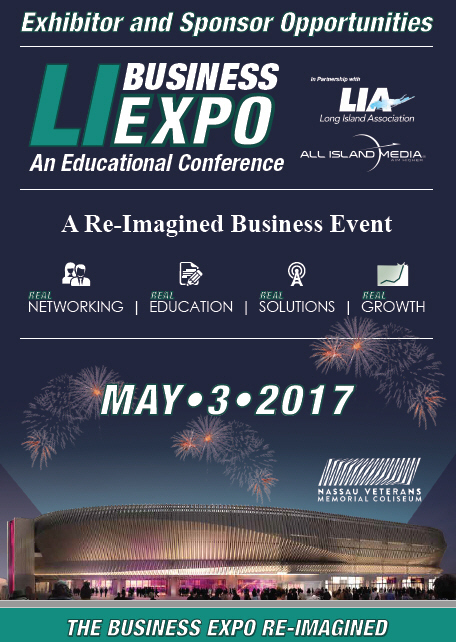 make a special Long Island appearance. Taking Business & Tourism to New Heights! Focused on taking your business to the next level. Free to Attend but must pre-register. Educating, engaging & empowering small & minority, women and veteral owned businesses to break through barriers. Manufacturers & product developers meet. Lowering costs & increasing revenue. Never post on 'Monster' again! Theodore Roosevelt Executive & Legislative Bldg. 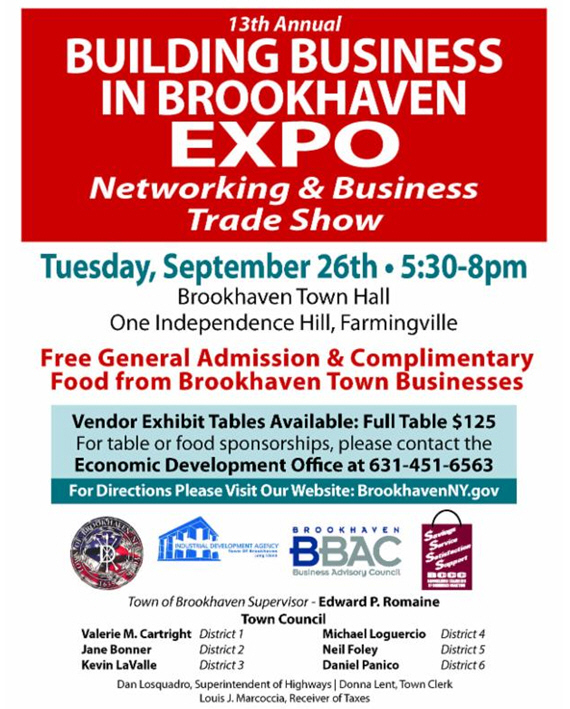 Check-in and Tours: 8:00 a.m.
Breakfast and panel 8:30 a.m.
New Millennium Development Services Inc. Hosted by Kiwanis Club of Huntington Children's Foundation, Inc.
a business plan, funding available for your business. 2 Expert Panels to help fund your growth. Closed from Monday December 21st through Friday January 1st. We will reopen on Monday January4th at 9 AM. give their perspectives on rising to the 'top'. 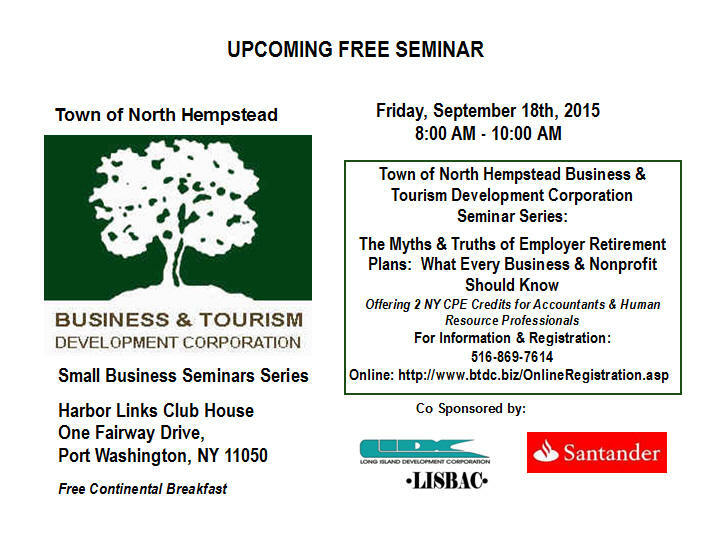 "The Myths & Truths of Employer Retirement Plans"
Presented by: The Ryan-Janowski Wealth Mgt Group. 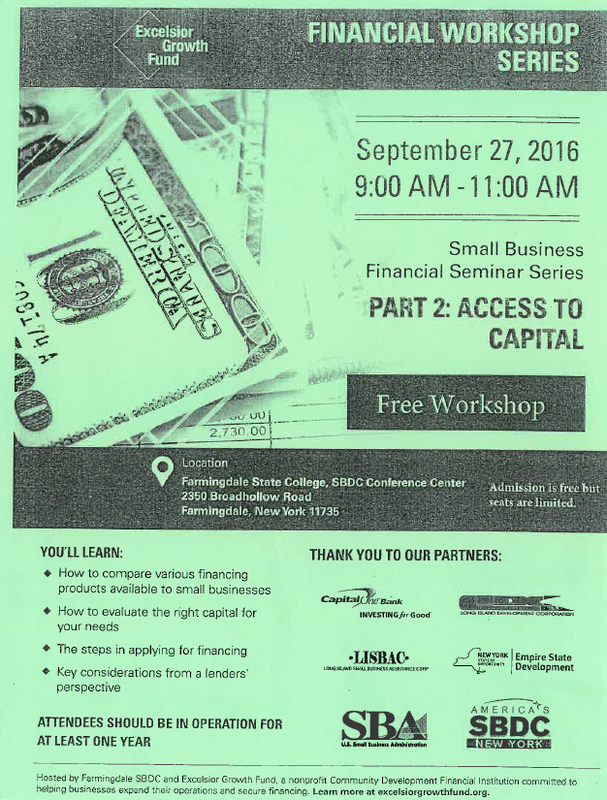 FREE Small Business Seminar "Affordable Care Act, Part II"
"Affordable Care Act, Part II"
Show Me the Money is a panel of experts who will educate attendee’s on a wide range of financing options available to businesses. 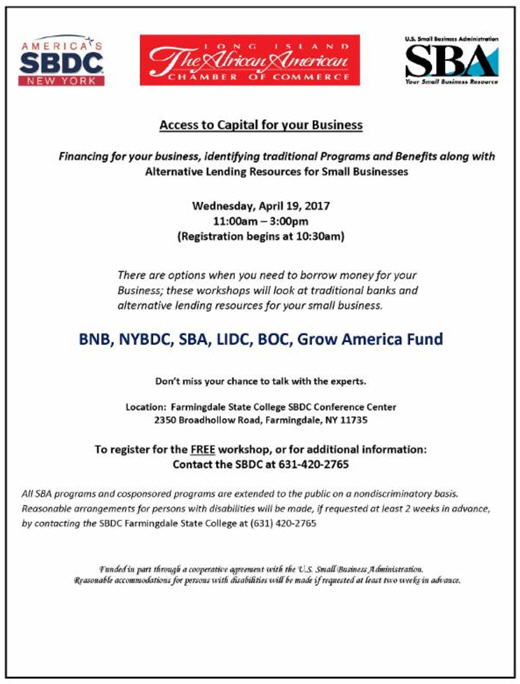 Presentations will focus on the different types of capital structures, how to prepare to win approval of financing, and how to be practical about choosing the right capital structure for your business. Our panelists will share the secret sauce, perspectives and advice. CPE and CLE credits available for qualifying attendants. by Wednesday, September 10, 2014. Come see us at the event. 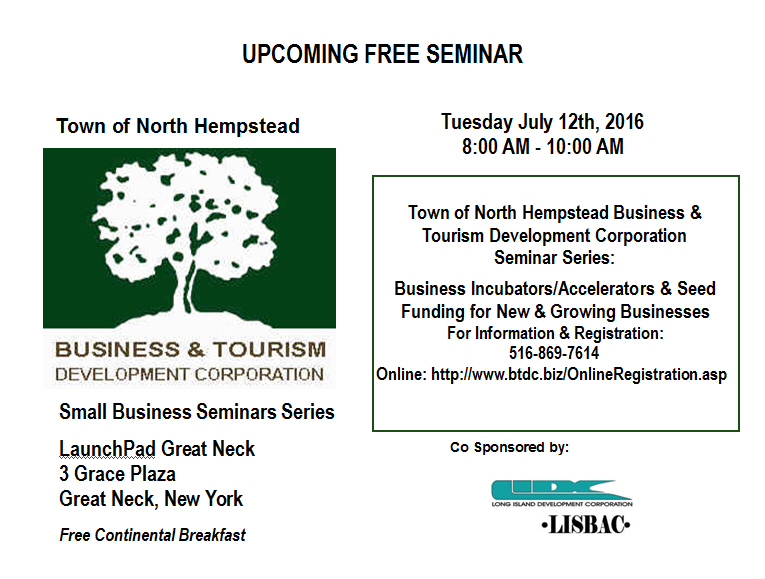 FREE Seminar 'SOCIAL MEDIA III"
Business & Tourism Development Corp.
"The Business of Art - Round 2"
Prepare in advance to deal with emergencies. Light refresments will be served. 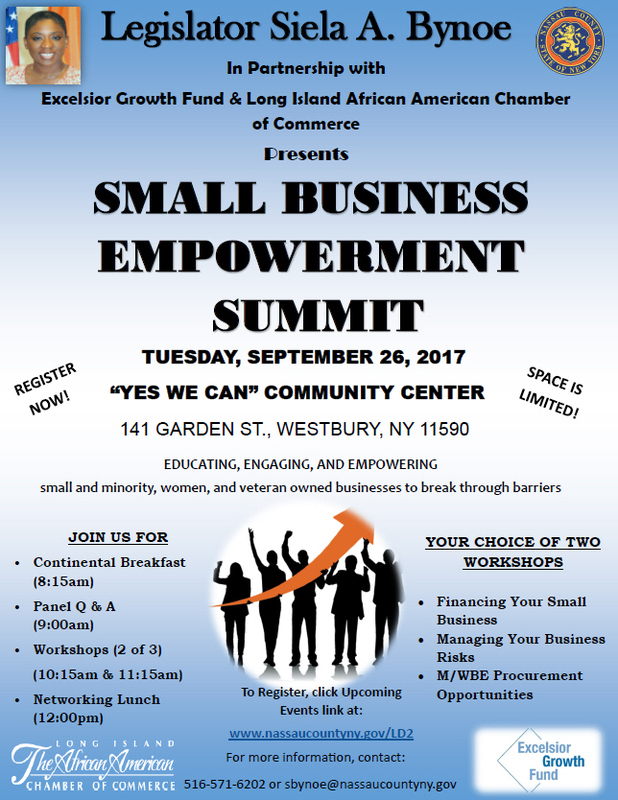 NY Senator Charles J. Fuschillo, Jr.
"Prep of RFP & Bid Responses"
"MAKING YOUR BUSINESS AS THE MAIN EVENT"
emailed once registration is completely submitted. Third and final seminar of a three part mini-series. 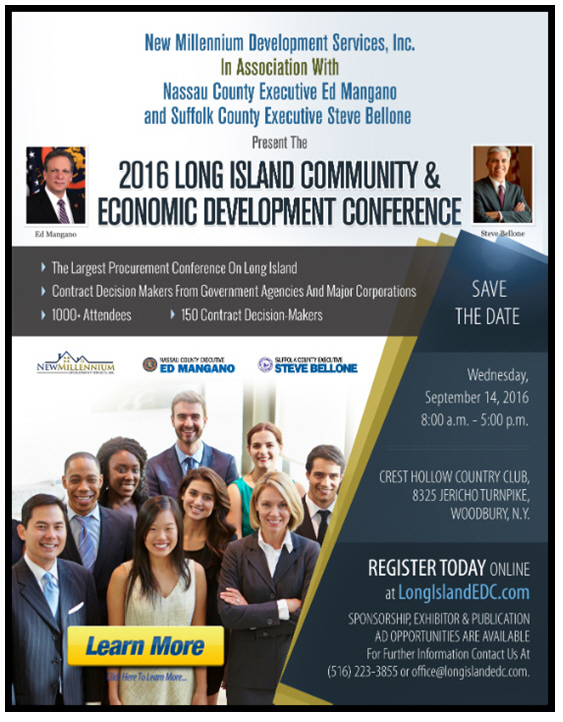 This seminar is a must for businesses participating in the largest community event ever undertaken by the Town of North Hempstead. upon completion of online registration. Meet professionals in the fields of finance, law & insurance. 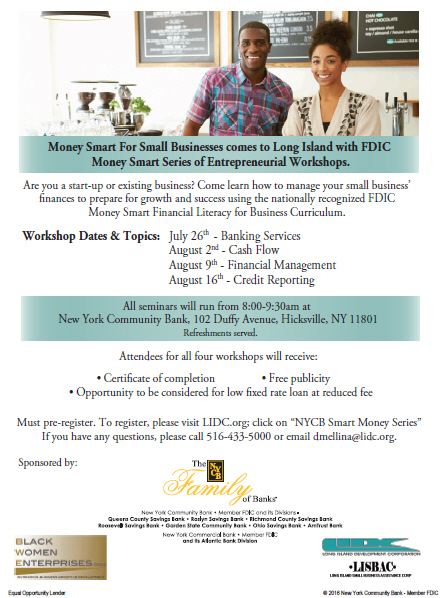 Details: LISBAC/BWE/LIDC/GAPSCAP Location: 700 Hempstead Tpke Elmont, NY 11003 Seminar Leader: Patty Cook, Govt Specialist Featured Speaker: Pat Edwards, Citibank RSVP: 866-433-5432 nstein@lidc.org Flyer attached.